"The Fun Ships"- that is exactly what the Carnival ships are. More affordable cruises, lots of neon lights, not that much elegance and formal atmosphere. Carnival is catering towards younger passengers and the main objective aboard the vessels is party, party and party again. Carnival Cruise Line is now one of eleven cruise ship brands owned and operated by Carnival Corporation & PLC. The company has the largest fleet in the group, with 24 vessels currently in operation. The other brands include Princess Cruises, P&O UK, P&O Australia, Cunard Line, Holland America Line, Seabourn Cruises, Costa Crociere, Aida Cruises, Ibero Cruises and others. Carnival Cruise Line started in 1972 when Ted Arison bought one ship, the "Mardi Gras", for $1, and assumed its debt. At the time, Bob Dickinson worked for Carnival's parent company, American International Travel Service of Boston. In 1973, after Carnival had lost $8 million in six months, Dickinson was sent to Miami to "unload the turkey," as he recalls, noting he had never even seen a cruise ship at that point. Instead, he studied the company's problems and figured they could be fixed. Carnival Cruise Lines employs at the moment about 3,500 people on shore - the majority at corporate headquarters in Miami - and offers over 35,000 jobs on its cruise ships. 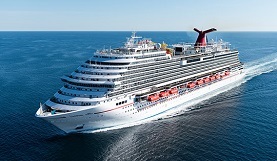 In October 2012, Carnival ordered a brand new 133,500 GT ship for their Carnival Cruise Line brand. 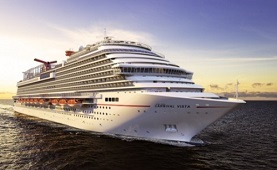 The ship was built by Fincantieri shipyard in Italy and named Carnival Vista. It sailed its maiden voyage on May 1, 2016. 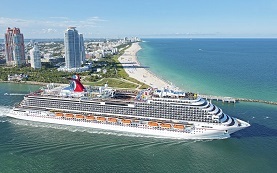 A sister to Carnival Vista, Carnival Horizon, joined the fleet in 2018. Queen Latifah was the Godmother of Horizon for its christening in New York on May 23, 2018. Another cruise ship from this class - Carnival Panorama will be joining the fleet in December 2019. What can employees expect from Carnival? Slightly lower salaries and somewhat lower standards when selecting candidates comparing to most of the other major cruise lines. Carnival crew members are like their clientele, they like to party and most of them believe that the more "loose" atmosphere and the presence of younger passengers makes up for the slightly lower salaries. Carnival Panorama: Registry - Panama; inauguration 2019; 133,500 gross tons; 3,980 passengers, 1,450 crew members. Itineraries: Mexican Riviera out of Long Beach, CA. Carnival Horizon: Registry - Panama; inauguration 2018; 133,500 gross tons; 3,936 passengers, 1,450 crew members. Carnival Vista: Registry - Panama; inauguration 2016; 133,500 gross tons; 3,936 passengers, 1,450 crew members. 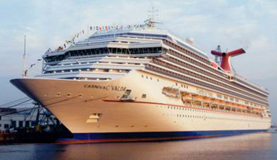 Carnival Breeze: Registry - Panama, inauguration 2012, 130,000 gross tons, 3,690 passengers, 1,367 crew members. Itineraries: Mediterranean out of Venice, Italy and Barcelona, Spain; Trans-Atlantic; Caribbean / Bahamas out of Miami, FL. 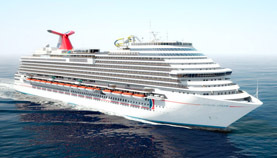 Carnival Magic: Registry - Panama, inauguration 2011, 130,000 gross tons, 3,690 passengers, 1,367 crew members. Carnival Dream: Registry - Panama, inauguration 2009, 130,000 gross tons, 3,652 passengers, 1,367 crew members. Itineraries: Mediterranean out of Civitivecchia (Rome), Italy, Bahamas out of New York, NY, Eastern/Western Caribbean out of Port Canaveral, FL. Carnival Splendor: Registry - Panama, inauguration 2008, 113,300 gross tons, 3,006 passengers, 1,150 crew members. Itineraries: Mexican Riviera out of Los Angeles. Carnival Freedom: Registry - Panama, inauguration 2007, 110,000 gross tons, 2,974 passengers, 1,150 crew members. Itineraries: Western Caribbean/Eastern Caribbean, Europe. Carnival Liberty: Registry - Panama, inauguration 2005, 110,000 gross tons, 2,974 passengers, 1,160 crew members. Carnival Valor: Registry - Panama, inauguration 2004, 110,000 gross tons, 3,400 passengers, 1,180 crew members. 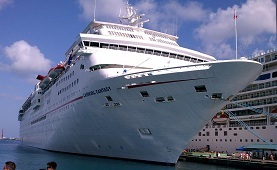 Carnival Miracle: Miracle: Registry - Bahamas, inauguration 2004, 88,500 gross tons, 2,120 passengers, 934 crew members. Carnival Glory: Registry - Panama, inauguration 2003, 110,000 gross tons, 2,974 passengers, 1,150 crew members. Itineraries: Eastern/Western Caribbean, Bahamas, Canada/New England. Carnival Conquest: Registry - Panama, inauguration 2002, 110,000 gross tons, 2,974 passengers, 1,150 crew members. Itineraries: Western/Eastern Caribbean, sailing from Galveston, Texas. 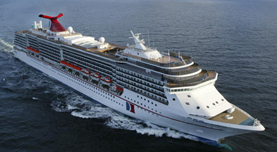 Carnival Legend: Registry - Panama, inauguration 2002, 86,000 gross tons, 2,124 passengers, 930 crew members. Itineraries: Western Caribbean, sailings out of Tampa, Florida. Carnival Pride: Registry - Panama, inauguration 2001, 88,500 gross tons, 2,124 passengers, 930 crew members. Itineraries: Bahamas/Eastern Caribbean out of Baltimore, MD. Carnival Spirit: Registry - Panama, inauguration 2001, 88,500 gross tons, 2,124 passengers, 930 crew members. Itineraries: Based in Sydney, Australia with cruises to South Pacific, Fiji, Vanuatu, New Zealand. Carnival Victory: Registry - Panama, inauguration 2000, 101,509 gross tons, 2,758 passengers, 1,100 crew members. Itineraries: Southern Caribbean out of San Juan, Puerto Rico and Barbados. Carnival Triumph: Registry - The Bahamas, inauguration 1999, 101,509 gross tons, 2,758 passengers, 1,100 crew members. Itineraries: Canada/New England out of New York, NY, Bahamas out of Norfolk, VA and Charleston, SC, Eastern/Western out of New Orleans, LA. Carnival Sunshine (former name - Carnival Destiny): Registry - The Bahamas, inauguration 1996, 101,353 gross tons, 3,360 passengers, 1,040 crew members. Itineraries: Western/Eastern Caribbean, sailing out of Miami, FL and New Orleans, LA; Europe. Carnival Elation: Registry - Panama, inauguration 1998, 70,367 gross tons, 2,052 passengers, 920 crew members. Itineraries: Baja Mexico, sailing from San Diego, CA. Carnival Paradise: Registry - Panama, inauguration 1998, 70,367 gross tons, 2,052 passengers, 920 crew members. Itineraries: Baja Mexico out of Los Angeles, CA. 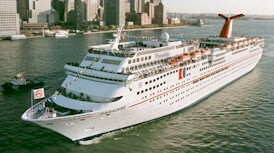 Carnival Inspiration: Registry - The Bahamas, inauguration 1996, 70,367 gross tons, 2,052 passengers, 920 crew members. Itineraries: Western Caribbean out of Tampa, FL. 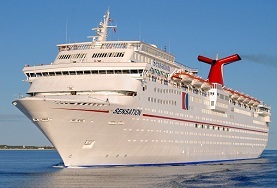 Carnival Imagination: Registry - The Bahamas, inauguration 1995, 70,367 gross tons, 2,052 passengers, 920 crew members. Itineraries: Bahamas, Western Caribbean out of Miami, FL. 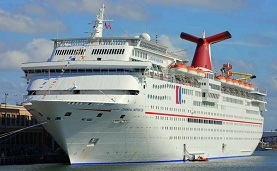 Carnival Fascination: Registry - The Bahamas, inauguration 1994, 70,367 gross tons, 2,052 passengers, 920 crew members. Itineraries: Bahamas out of Jacksonville, FL. Carnival Sensation: Registry - The Bahamas, inauguration 1993, 70,367 gross tons, 2,052 passengers, 920 crew members. Itineraries: Bahamas out of Port Canaveral (Orlando), FL. 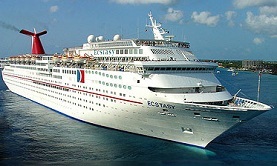 Carnival Ecstasy: Registry - Panama, inauguration 1991, 70,367 gross tons, 2,052 passengers, 920 crew members. Itineraries: Western Caribbean out of Galveston, TX. Carnival Fantasy: Registry - Panama, inauguration 1990, 70,367 gross tons, 2,052 passengers, 920 crew members. Itineraries: Western Caribbean out of New Orleans, LA and Mobile, AL.